Built in 1884, this old structure which stands aloof like the criminals it once imprisioned,is now guardian to buckets of paint. Its rusty iron bars and smokeless chimney are silent reminders that more than 50 years have passed since it held unwilling guests. In 1897 the little Walkerville jail, which, in its heyday had held at least one murderer,two train wreckers and a host of petty criminals,was closed. A new lockup was established in the new police building which was located nearby on the east side of Walker - where Via Rail is now located. Back in 1887 when the Walkerville jail was mainly a stopover for men who imbibed too freely and walked too unsteadily, jail comforts were nil. The interior consisted of one room with allownaces for a wrought-iron bed and a clay-and-brick stove. Prisoners had to chop wood and feed the stove themselves when the weather was cold.The floor was cemented and the bricks of the walls were laid in sections with uprights of sturdy oak. High in the walls of the north [or river] side are twin windows, stoutly barred with iron, but the grills covering the bars crumble at a touch. The old jail was first put to use by Walkerville's first police chief, Mr.Amos B.Griffith. Chief Griffith was appointed by Hiram Walker himself in 1887 and served until retirement in 1920. When Chief Griffith first assumed his duties,Walkerville had a population of about 500 persons and all of the municipality was located north of Wyandotte street in a cluster of houses that crept together near the bank fo the Detroit River in the vicinty of the old ferry dock at the foot of Devonshire. When Chief Griffith was serving the populace of Walkerville, he received $40 per month. Besides taking care of the jail and any prisoners, he made the rounds of Walkerville and had the added responsibility of lighting and extingusihing seven oil street lamps which illuminated the village thoroughfares. Chief Griffith was assisted by James McGillivray. Between them the two men worked 12 hour shifts. One commenced at midnight and ended at noon the nexdt day. The other started from there and ended at midnight. At night these Walkerville protectors madetheir rounds with the aid of the old-fashioned "bulls-eye" lantern stuck in the belts of their tunics. 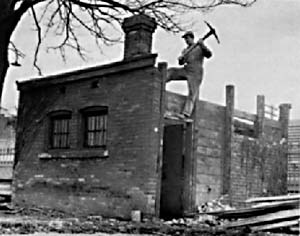 Located between the Hiram Walker Garage and the Shipping department near the CNR railroad tracks, the old Walkerville jail was demolished on March 12, 1954. The space occupied by the jail was used for an enlarged shipping yard for motor transports.